Correlate is a mobile application concept that offers users an optimised and organised approach to managing messages, notes, contacts and other content that they may have with medical professionals. Look through your address book on your phone and see how displaced contacts are. Friends, family, your pilates teacher, your doctors surgery, your aunt who you haven’t spoke to in around a decade. Also look at the notes section- shopping lists, passwords, expenses. Often, medical information is something serious for the user. Correlate is a platform for solely medical related information, all stored in one location. Not everybody has a linear medical history and ability to manage their conditions through the GP alone. I myself have a complicated and fragmented process in which I need to order an unlicensed heart medication, and this was where the primary inspiration for Correlate started. I began to think about how many other people there are for whom the usual -Go to the GP, and get a prescription/repeat prescription simply won’t work. Having a medical condition is enough of a problem in itself. Having to then take care of certain logistics yourself too because of this feels unfair. Individuals may also face psychological problems due to the severity of their conditions. They may also be under outpatient care for other conditions, severe or non severe. ABOVE: A recent analysis of the journey it took for me to reorder medication. It took 18 days to collect the medication from the date I first realised I needed to reorder- this is too long. 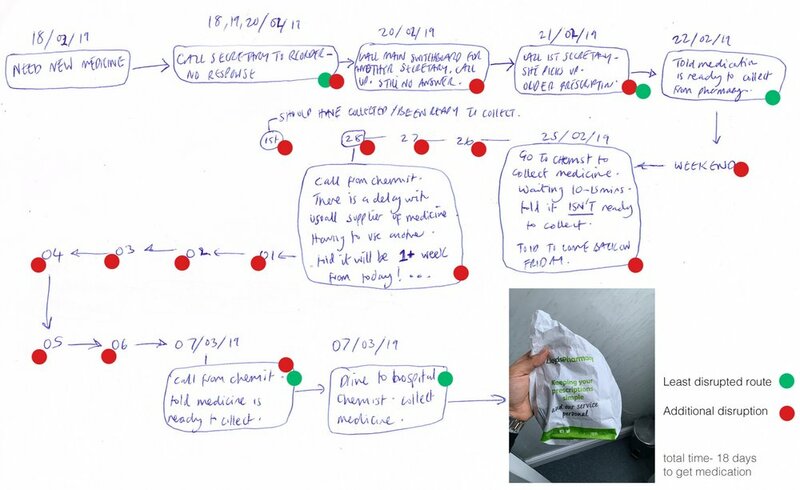 It is good to note that this journey was quite extreme due to the delay from a supplier, however it is still worthwhile to highlight the unnecessary trip to the pharmacy, as well as how much work I had to do myself (8 Phone calls). One of the challenges with the design for this app was achieving the sweet spot between creating something that allowed for ‘organisation and optimisation’, without making the process long winded for the user. I began to think about the notion of ‘decision making’ and the different levels of this process, and how to create flows for the user that gave them the option to ‘skip’, as well as present them choices that were compulsory. Compulsory actions that they need to perform in order to progress. Using minimalistic visuals and short, snappy copy should allow for the user to not become frustrated. This should be done as a way of organising information so that the user can access easily when they need in the future. If the decision is a soft one, and something that could be viewed as an ‘add on’, i will subtly add elements that allow the user to progress without having to make this decision. They could come back to make the decision in the future should they wish. How likely are they to come back? “Too much rigidity and forceful decisions= lengthy process and frustrated user. Aquatic and soothing, Correlate utilises a palette of palette of frosted blues, navy rubber and glowing white. Bright contrast accents and subtle tonal fades mellow a scheme that otherwise could be viewed as ‘severe’, into something enticing and gentle. Delicate tonal shadows add depth. The scheme remains sympathetic to the medical industry, whilst allowing its user to experience a balance between functional simplicity and elegant aesthetics. 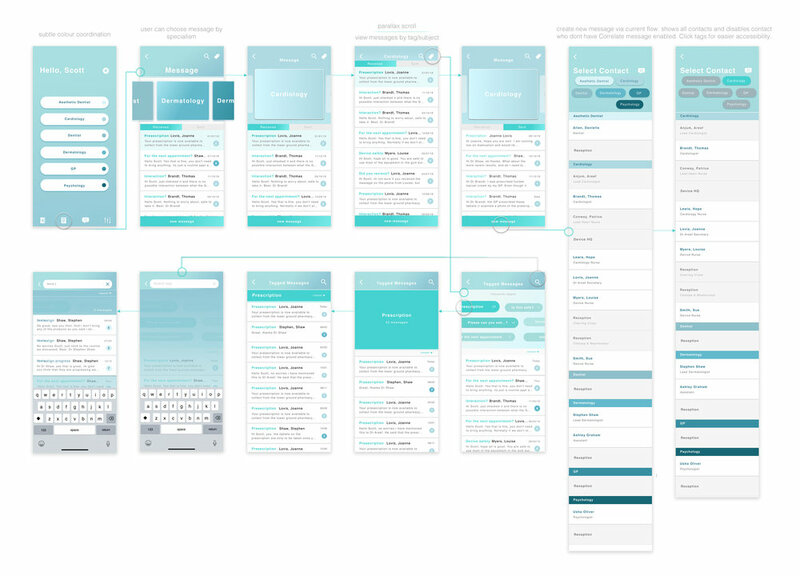 First stage mid fidelity wireframes for in app message feature. Focusing on multiple accessibility routes and clickable elements. Upon reflection and user feedback with an interactive prototype, i changed some visual elements for the final mock ups. Resolved iteration: single tap. Testing showed if the user inputs wrong choice they would simply click the back arrow. Therefore the confirmation ‘Go’ button is redundant. Input field also changed for ‘New tag’…once user types, the arrow becomes active. User testing feedback: not distinguished enough “add’ & ‘view’. Nor intuitive. Why is all content not on one screen? Resolved iteration: Display all notes under that specialism, and a button to create ‘new’ note. A profile for all categorised notes where you can perform multiple actions such as ‘view’ and ‘add’. U P O N R E F L E C T I O N . . . This project was heavily informed by the decision making process, and how to make this most intuitive, yet also allow for ‘organisation and optimisation’ for the user- the 2 terms that were so prevelant from the beginning of the research phase. ‘Accessibility’ was also a large focus point- how many routes /access points can be provided for the user to be able to achieve the same task from a variety of screens. User testing was immensely valuable for pinpointing the most effective flows as the contrasting nature of ‘organising yet intuitive’ meant there was a large amount of early iterations where i tried to achieve a balance of the 2, but the user immediately found flaws. Priority for the Visual Design was to be ‘empathetic’ and ‘respectful’ to the medical nature yet not stark or cold as the target audience should be encouraged to use the app, rather than feel intimidated.